Black-necked Stilts are eye-catching birds with their contrasting black and white on those long bubble-gum red legs! I look forward to their arrival every year. The first one I ever saw was at Malheur National Wildlife Refuge in Oregon back in July of 2005 when I was really just starting to get passionate about birding. I used to see several dozen at each visit to the Gilbert Water Ranch in Arizona. There they can be seen pretty much year round. According to my eBird records, I once saw around 100 on one day there. In Idaho, I see them regularly in the right habitat from April through about mid-September. My highest tally in Idaho is around 30 birds at one location. 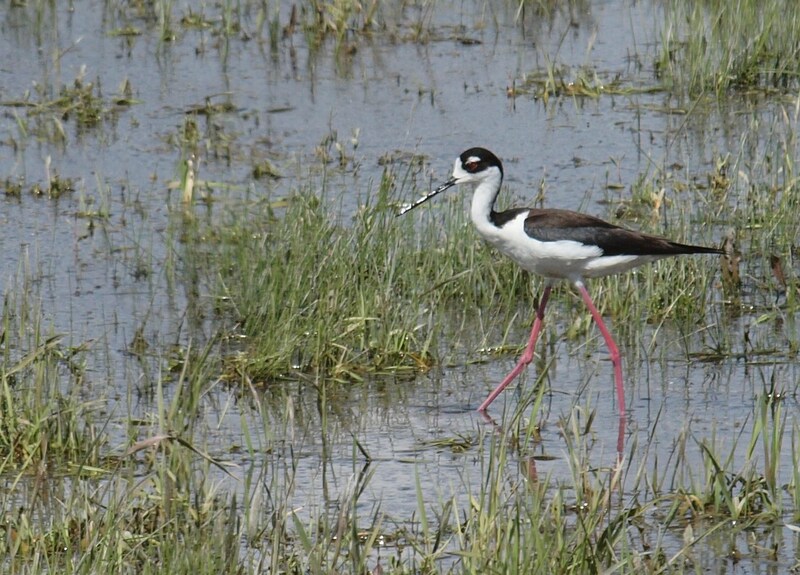 Prior to taking these photos, I never noticed the red eye or the brown back on some Black-necked Stilts. 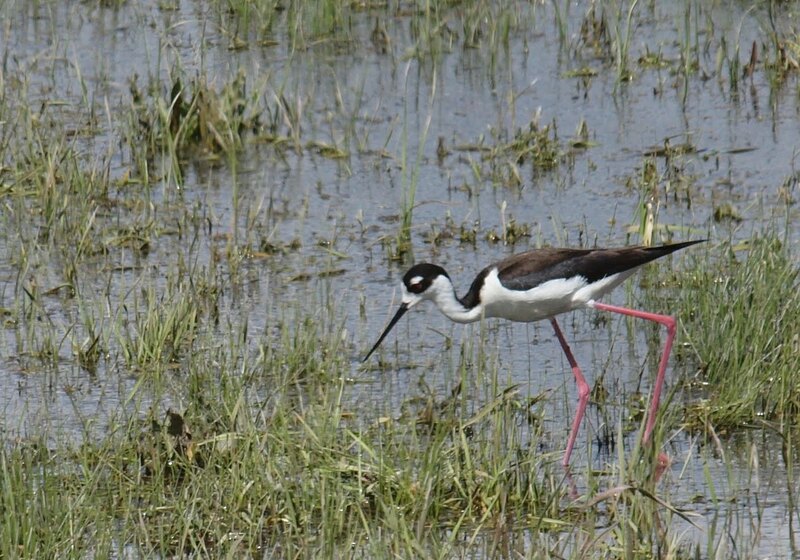 These last couple of weeks I had been assuming that the stilt pictured above was a first-year bird that had not yet turned completely black, but I was wrong. Females have the brown backs and males have black backs as shown in the photo below. I must have been photographing a breeding pair. Reading Paulson's Shorebirds of North America (which features a handsome male Black-necked Stilt on the cover) and the field guide Birds of Western North America: a Photographic Guide I also read that males during breeding season may acquire a pinkish tinge to the breast...and looking at the photo below, I can kind of see that. Now I regret not paying more attention to them in the field. Alone, or with a group, it has always been "oh, there's a Black-necked Stilt" and I neglected to enjoy the finer details. Well, that is one thing photography is helping me do is to look harder and longer at even my common birds. I did a post awhile back on Black-necked Stilt migration patterns using eBird sighting maps. Click here if you are interested. 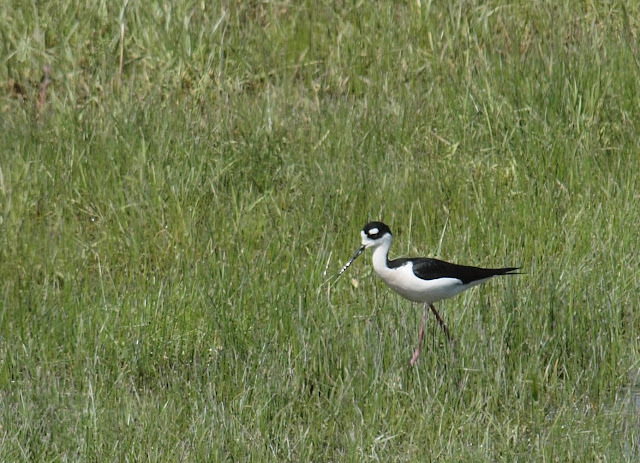 I love black-necked stilts and American Avocets. I saw my first ones in Utah near the Great Salt Lake. What a thrill it was. They still continue to delight me! I did not know about the brown backs of the females or the pinkish tinge thing with the breeding males. Thanks for the education! Nice captures!